The Angelcare AC215 Digital Video, Movement & Sound Baby Monitor allows parents to relax while baby is resting. Digital audio, secure video, and advanced movement monitoring enable parents to better respond to baby's needs. Angelcare AC215 Digital Video, Movement & Sound Baby Monitor offers parents the ultimate peace of mind, with its ultimate and sophisticated design. Angelcare AC215 Digital Video, Movement & Sound Baby Monitor allows parents to relax while baby is resting. Advanced movement, audio and video monitoring enable parents to better respond to baby's needs. The patented sensor pad is designed to be placed under baby's mattress where it senses subtle movement while baby sleeps. The movement monitoring systems alert parents if no movement detected after 20 seconds. Our newly launched systems offer even more! 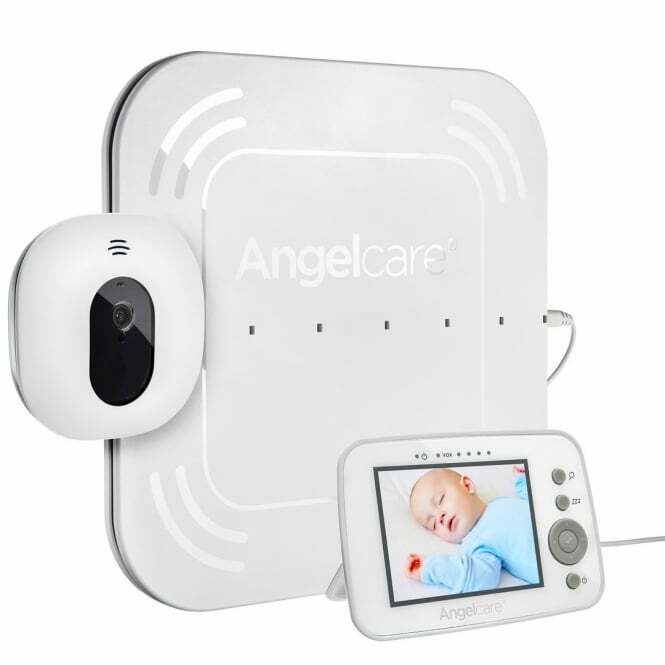 The Angelcare AC215 Digital Video, Movement & Sound Baby Monitor includes the low-profile, wall-mount video camera and a parent unit with a 3.5" (9 cm) LCD touch control display. The parent unit can be used to monitor baby and room temperature in the real time. Rest assured with the ultimate peace of mind.